The great thing about travel photography is that as you travel, you get a multitude of opportunities to take all sorts of photos. Portraits, landscapes, street scenes, nature and wildlife, cityscapes...you name it, you'll encounter it on a typical journey. There are obviously a ton of places you can travel for a photography adventure. I know a lot of people from the U.S. that like to hop the pond and explore Europe with their camera. Conversely, a lot of folks from Europe come this way to explore the great American landscape. A personal goal of mine is to go on safari in Africa. Talk about a place to delight the eyes and your camera! I've never had the pleasure of visiting Peru but based on what I'm hearing from other photographers, it's a place I need to visit, and soon. With that in mind, I got together with a few photographers that have experienced Peru, and we put together this quick collection of photos from one of the most gorgeous places on earth. We've even included a few tips about how to get these same kinds of photos! 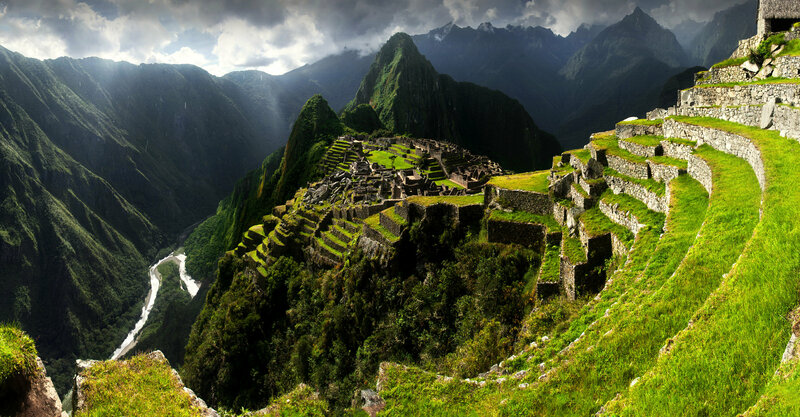 The first thing that many non-Peruvians think of when they think of Peru is Machu Picchu. 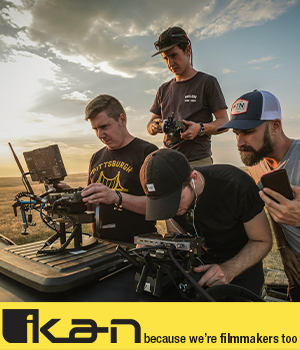 For me (and many of my compatriots), this is among the holy grail of sites to visit with our cameras. One look at the image above tells you why. Most of the "postcard shots" of Machu Picchu are taken from closer to the citadel, a point near the end of the walls that extend from the foreground to the midground on the right side of the image above. But by taking a position like this one, you have access to creating a wider shot of the area, which not only gives you a clue as to the fantastic dropoff on the side of the city but also puts some context to just how remote and high up this ancient city actually is. What's more, this image makes great use of leading lines - both those mentioned earlier on the right side of the shot and those created by the sharp, pointed peaks directly behind the city which help to give the image some verticality. As I mentioned in the introduction, the great thing about traveling is that you can take photos of all sorts of subjects. 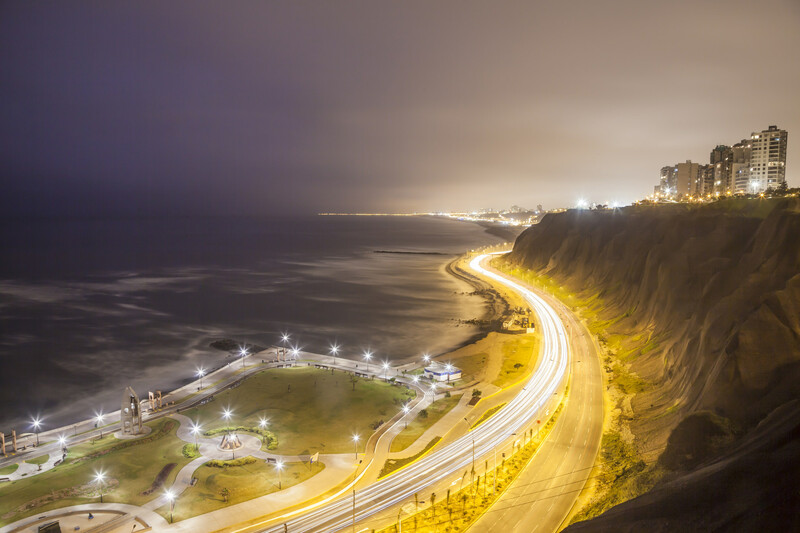 Though Peru is most well known for its landscapes and people, the city of Lima is a beautiful subject for photos as well, as you can see in the image below. Even if you aren't a master of cityscapes or long exposures, travel photography is all about expanding your horizons and visiting new places, meeting new people, and trying new things. When visiting Peru, take some time to try your hand at a long exposure like the one above. In this case, the image benefits from the high perspective looking down on the highway. Rather than giving us the typical street-level view, this higher perspective allows us to see a much longer light trail created by the cars on the highway. And, like the previous image of Machu Picchu, the photographer managed to incorporate leading lines that take us along the coastline and direct our eyes toward the lights of the city in the background. That makes for one active experience when viewing this photo! 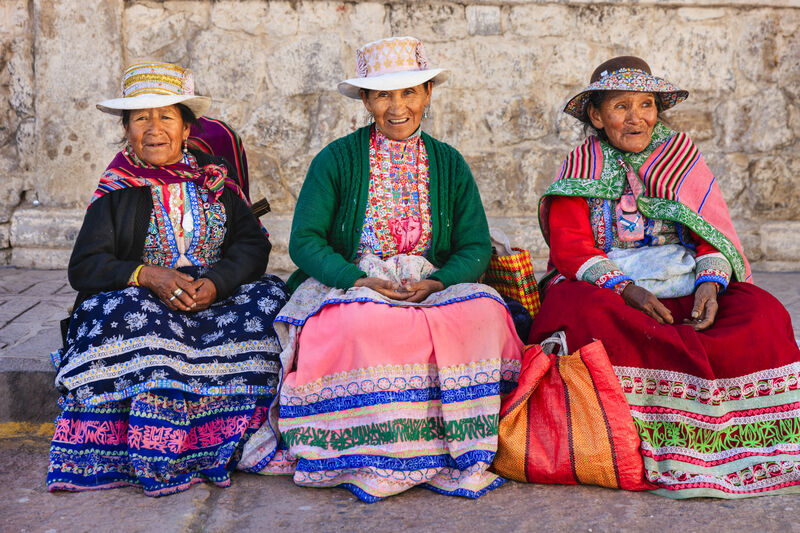 No matter where you travel in the world, you'll be hard-pressed to find a people and a culture that's as vibrant and colorful as those in Peru. That makes taking portraits on your trip to Peru an absolute must. The people of Peru are friendly and welcoming, and so long as you approach them with a smile on your face and in a respectful manner, you shouldn't have any difficulty taking authentic portraits of people you encounter on your travels. In the image above, the simplicity of the shot - the nondescript background and even lighting - help us focus on the two primary features: the faces of the women and their fantastically colorful dresses. You'll encounter gorgeous patterns and colors on your journey, and when you do, it's important that you keep other elements in the shot more subtle so you can highlight the beauty of the colors, patterns, and textures you'll find along the way. Of course, another way to show off the colors and textures of Peruvian culture is to make them the subject of your photos. 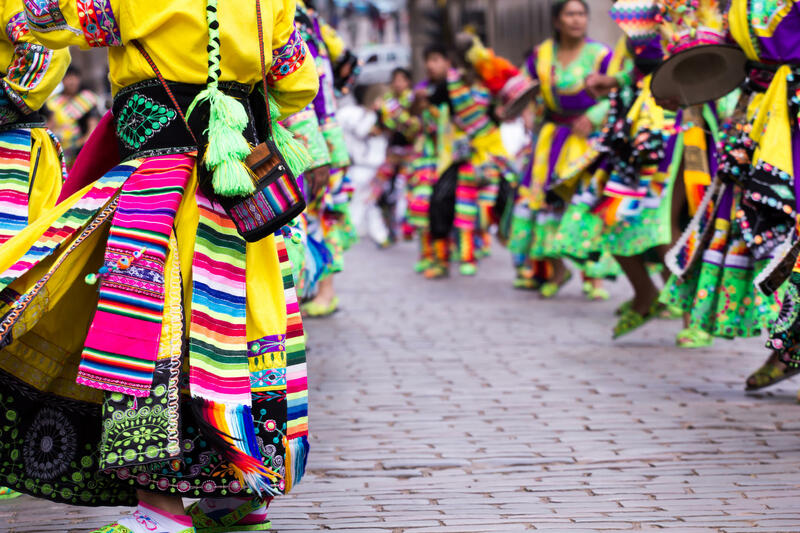 In the image above, rather than creating a traditional portrait, the photographer chose instead to focus on the wardrobe of the dancers as they make their way along a parade route in Cusco. By creating a faceless portrait, the wardrobe of the dancers - in it's colorful and vibrant glory - becomes the star of the shot. Remember, traveling is an opportunity to stretch your boundaries. Take that opportunity to try something unique like a faceless portrait. Speaking of stretching your boundaries, a great way to travel around Peru and see all the sights mentioned above (and more!) is to travel by train. As you can see in the image above, there's plenty of beauty to behold as you crisscross this gorgeous country in the comfort of a train car. What's more, you can hook up with a group like Special Interest Tours that takes care of all the in-country details for you, from the train rides to day trips to explore Machu Picchu to meals and hotels and everything in between. Their Ultimate Peruvian Railway Experience is the pinnacle of Peruvian travel for photographers and train enthusiasts alike. The tour includes exclusive passage on the Ferrocarril Central Andino Railway main line, which takes you to nearly 15,700 feet above sea level, taking you through breathtaking mountain scenery and giving you firsthand views of natural wonders like the Junin Flamingo Lagoon, all from open train cars that give you unobstructed vantage points for taking photos along the way. But your participation in the Ultimate Peruvian Railway Experience doesn't mean you're limited to travel by train. Special Interest Tours also provides coach buses that take you off the tracks and into the surrounding territory, so you have opportunities to photograph landscapes like Lake Titicaca and the unique reed boats that inhabitants of the area make, like those seen below. 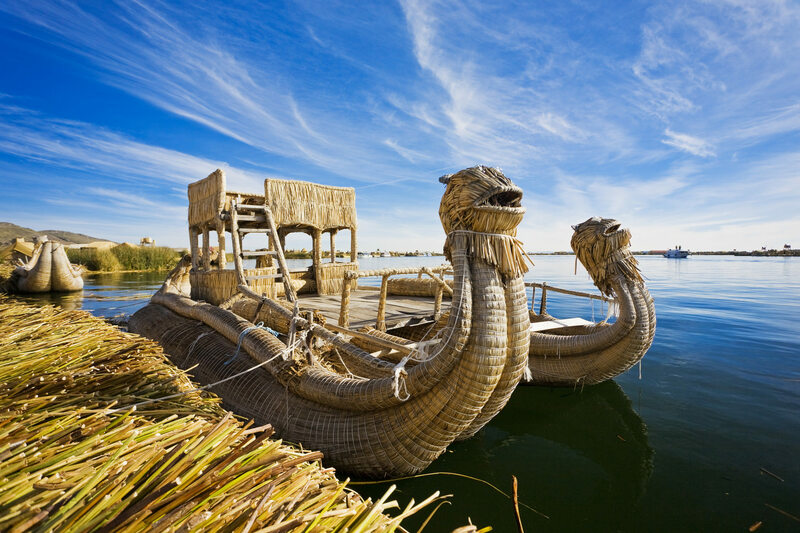 In fact, since Special Interest Tours is all about immersing you in the local culture, you'll have a chance to take a boat ride to one of the many man made islands in Lake Titicaca. There, you can try your hand at creating portraits of the locals, crafting a photo of the sunset as the light fades over the lake, and even give night photography a shot as you find yourself under a blanket of stars. The tour even includes a foray on the Andean Explorer, a railway that takes you through the Andes Mountains, along the Huatanay River to Cusco, from which you can venture out to explore Machu Picchu. In the end, there are plenty of places to visit in the world that are sure to delight you as a traveler and as a photographer, but for my money, Peru has to be at the top of the list. 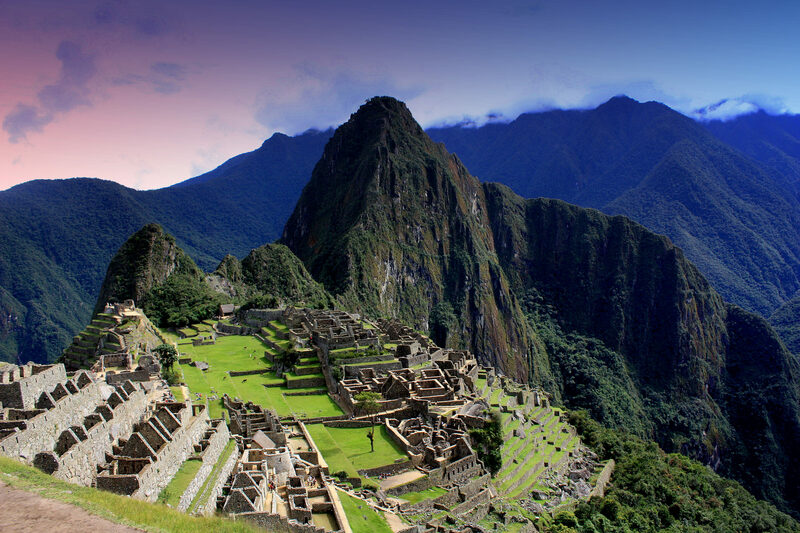 From iconic sites like Machu Picchu to breathtaking landscapes like the Andes Mountains to the people and culture of this wonderful nation, there's just too much beauty to pass up! 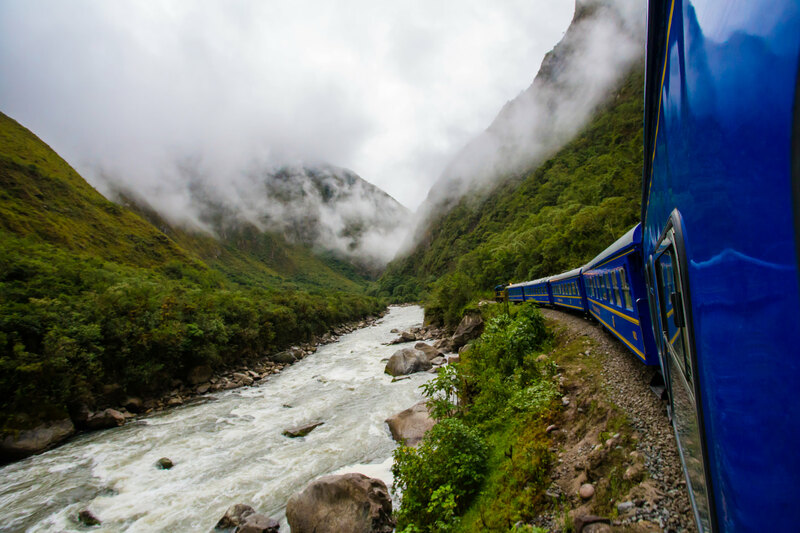 If you're interested in seeing all of these sights for yourself, visit Special Interest Tours to learn more about their two-part Ultimate Peruvian Railway Experience. The trip is scheduled for September 26 to October 5, 2017, so start planning your adventure now!